A Chart of Accounts in SAP represents the combined list of GL Accounts and master data record used in one or more company codes. All the GL Accounts in Chart of Accounts will have the Account name, Account number and Control information. The Control information decides how the GL Accounts can be created. The chart of accounts are mostly defined at client level and the master chart must be allocated or marked for every company. This chart relates to the day to day posting. In SAP it is mandatory that this Operating Chart of Accounts is assigned to the company code. This chart of accounts is used for consolidating all company codes with a different operating chart of accounts falling under a company. It is not mandatory to assign this group chart of accounts to company code. This Chart of Accounts contains the GL Accounts to meet the specific statutory or legal requirements of a company from where a company code operates. Assigning Country chart of accounts to a company code is optional in SAP. How to Define Chart of Accounts? In the chart of accounts list you enter the charts of accounts that you want to use in your organization (at client level). The list already contains sample charts of accounts for some countries. Charts of accounts GKR and IKR, for example, have been entered for Germany. Option available is either to choose country specific COA defined by the SAP or to define new COA for a company code specific. For defining a new COA select the option new entries from the task bar and fill the required data. 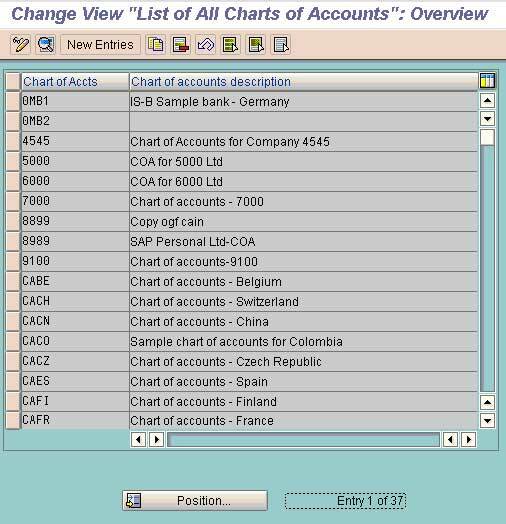 Chart of Accts: Key that uniquely identifies a chart of accounts. Chart of accounts description: You enter a descriptive name for the chart of accounts here. Maintenance language for the chart of accounts: Language in which the chart of accounts is created. All accounts have a description in this language. Master data can only be displayed or maintained in this language. If you carry out functions with the account, the account name can be displayed both in the maintenance language and in the available alternative languages. Length of the G/L account number: This determines the length of a G/L account number in the chart of accounts. This number may have up to ten digits. If you do not need ten digits for your accounts, you can avoid the need for proceeding zeros by reducing the length of the G/L account number. The system includes zeros to the left of the number 0. Control of how a cost element can be maintained when maintaining a G/L account. • No maintenance of cost elements. • Cost elements maintained manually. A push button is available for this purpose, with which you can go directly to the related cost element. • Cost elements maintained automatically. When you save a new G/L account, the related cost element is automatically created. A prerequisite is that a default value for the cost element category has been set up for this cost element. If no default value is found, the system will not create a cost element. Chart of accounts which is used in the corporate group. Indicator which blocks the chart of accounts from being released i.e. no G/L accounts can be created for this chart of accounts in the company codes. This is only advisable if charts of accounts are created centrally and accounts are created locally. If this is the case, then the block prevents accounts from being created in the company codes for a chart of accounts. However the existing GL account within a chart of accounts can be used. Hi, If i can put block on this above screen so cannot able to post transaction on gl which is created locally.